Most people arrested for driving under the influence think that they have no chance of “winning” their DUI in Georgia. Particularly after being cuffed, having their driver’s license taken, being transported to jail, posting bond, retrieving their vehicle from impound, being prodded and generally humiliated, most people start off their search for information on how to get out of a DUI with a defeatist attitude. Like being diagnosed with cancer, never give up. 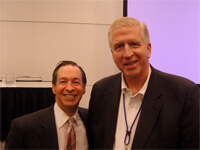 Never plead guilty when an excellent lawyer for DUI may be able to SAVE you from a DUI conviction. Many downtrodden citizens accused of DUI in GA never can move past the night of arrest, and do not search for DUI attorneys who may have solutions for how to get out of a DUI. No single factor or DUI lawyer attribute can provide the secret to learning how to beat a DUI in Georgia. Without question, the experience level and expertise in Georgia DUI laws of your DUI attorney is the most important variable and can lead to an acquittal, having the DUI dismissed, or possibly negotiating to have the DUI reduced to reckless driving. But first let’s look at the typical EVIDENCE needed for a DUI less safe case, or for being over the legal alcohol limit, or DUI per se. What was the driving conduct prior to the traffic stop or contact with the driver who is suspected of drunk driving? Car accidents often provide circumstantial evidence of bad or negligent driving, since officers rarely see the car wreck. However, in most GA DUI cases, a “moving violation” such as failure to maintain lane GA (FTML), failure to yield, speeding or following too close will be the basis for the pullover. Unlike 30 years ago, most DUI arrests in Georgia now have video (DVD) footage or audio of some parts of the officer’s alleged basis for the traffic stop, and (usually) the field sobriety tests conducted prior to arrest. 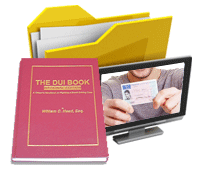 The video evidence and police report are the key items that a drunk driving attorney reviews, to find errors. 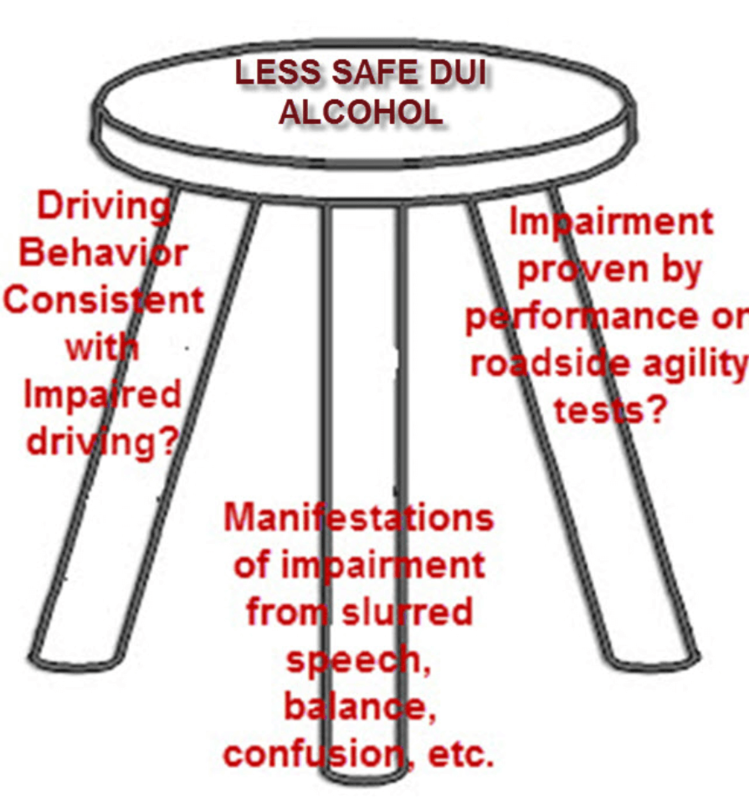 In police encounters at DUI checkpoints, no unsafe driving is typically observed, so this factor is missing, which HELPS the accused driver. How did the driver LOOK, SOUND and SMELL, when the law enforcement officer came in contact with the DUI suspect? Manifestations of the driver, which can be triggered by pure panic or fear, and noted by police officers, who are on alert for an impaired driver. The smell os alcohol or anything else that MAY impair, will be the basis for asking some preliminary questions, like, “When was your LAST drink?” or “Where is the weed?” Using verbal judo techniques, the officer is catching the nervous driver at a moment that usually causes the suspected intoxicated driver off guard, and he or she starts answering. The more the person talks, the more likely a DUI arrest will take place. That talking will produce incriminatory evidence, like slurred speech, confusion, or contradictions, real or imagined by the officer. How did the suspected impaired driver perform on the field sobriety tests or Romberg tests? All roadside testing prior to a DUI arrest are VOLUNTARY, OPTIONAL, and should never be attempted. Since NO PENALTY exists or not doing these subjectively-graded evaluations by police, politely decline. If you are asked why you won’t cooperate, ask to call a lawyer and keep asking after that. Declining voluntary tests will help you get out of a DUI if you hire an experienced lawyer that will fight for your case. At this point, the cuffs will be put on the driver’s wrists, and (usually) the implied consent notice for Georgia will be read to the detained driver. Due to recent favorable cases from the Supreme Court of Georgia and the Georgia Court of Appeals handed down in the latter part of 2017, some officers will AVOID reading implied consent to the suspected driver, and simply try to get the suspected drunken driver to VOLUNTEER to be tested. Never volunteer to give blood, breath or urine. Plus, if the officer reads the Georgia implied consent law notice to you, refusal to take the State test CAN cause total loss of driving privileges for a full year. However, you can change you mind and AGREE to the test at the police station or jail, so keep that in mind. If you do SUBMIT, to try to save driving privileges, always request your own independent test of your blood after first taking the State’s tests. You get to select where to get that independent test within a reasonable distance away, even if located in an adjacent county. You must be able to pay, with credit, debit or your HSA card. Cash also works well, and Georgia implied consent law permits you to be able to call someone to bring cash to your testing location, to pay for the independent test. If asked for a breath alcohol test, any refusal to take a breathalyzer test under implied consent after arrest cannot be used against the person at the criminal case, due to the recent appellate court cases mentioned above, Olevik and Council. For those who DO SUBMIT to post-arrest police breath tests, the incriminatory evidence obtained will be used in the OTHER type of DUI in Georgia, the per se DUI case. DUI per se in Georgia can be for ALCOHOL or for MARIJUANA. But, alcohol is the dominant type of DUI, by 20 to 1. So, this page talks about DUI alcohol per se, as shown in OCGA 40 6 391 (a)(5), for exceeding the legal Alcohol Limit. Because the ENTIRE per se alcohol case DEPENDS on the State’s BAC tests, and getting results ADMITTED at trial, the job of the DUI attorney is raise numerous DUI defenses to KEEP those numeric results out of evidence. 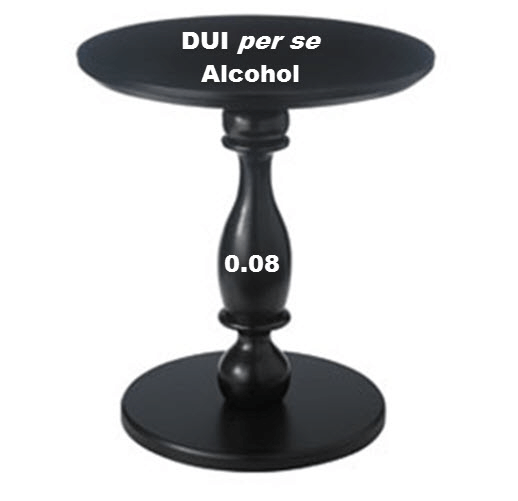 So, if you were lawfully arrested for driving impaired, even at a DUI checkpoint and you do not take a single field sobriety test or admit to drinking, or give the officer anything but your name and address, THIS TYPE OF DUI, which like the pedestal table shown above, can result in conviction if the “number” is allowed to be part of the State’s evidence at a jury trial. Your criminal defense attorney is tasked with preventing the admission of your post-arrest test results, at trial, by pretrial motions. Will I Lose My Driver’s License for DUI Refusal of Breath Alcohol Test? The overwhelming majority of DUI arrests in Georgia are for DUI-alcohol. That means that a DUI breathalyzer will be requested from the detained driver as the state-administered DUI test after he or she is arrested for DUI in GA. The exclusive breathalyzer currently used in Georgia is the Intoxilyzer 9000. So, Georgia implied consent law means that you either know your legal rights and follow them, or you face a suspended driver’s license for a FULL YEAR. 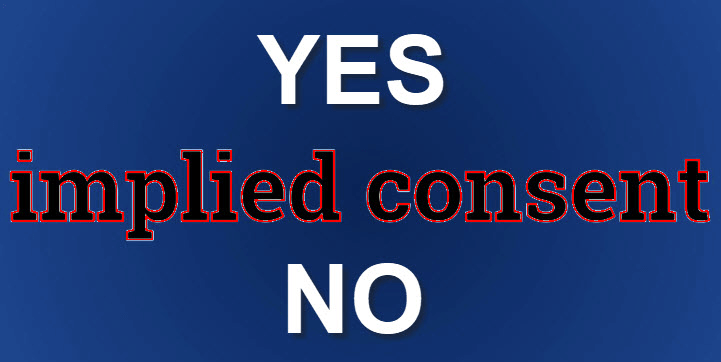 A DUI refusal is commonly called a violation of implied consent. This license suspension occurs merely from not taking the arresting officer’s requested alcohol blood test (by the means requested by the arresting officer – breathalyzer, blood or urine). Our DUI attorneys can tell MOST drivers have to retain some type of limited driving privileges. This testing is ONLY requested after your DUI arrest has taken place, which confuses many DUI GA arrestees. They expect this test BEFORE being arrested and think that this roadside agility testing and HGN eye test may allow them to be on their way home. 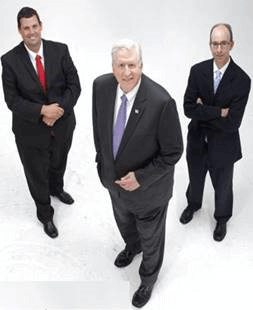 Call NOW to speak with criminal defense attorney William C. Head or his law partners, Larry Kohn or Cory Yager. 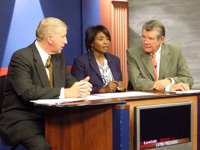 Our three DUI specialists are all recognized as experts on GA DUI law. Forty-one year veteran, DUI defense lawyer William “Bubba” Head is widely recognized as the best DUI lawyer in Georgia. No DUI lawyer in GA has won more DUI cases than William C. Head. He and both partners are Super Lawyers 2017, and each has thousands of success stories for helping prior clients facing criminal charges for drunk driving to learn how to beat a DUI at court. And, as this experience has been accumulated, each DUI attorney has earned a reputation for FIGHTING, and each has become KNOWN to be a formidable foe. The truth is that the best DUI lawyers in Georgia win most of their cases, whether done by plea negotiations, getting the DUI dismissed, reduced to reckless driving, or winning at trial or on appeal. Our DUI law firm is geared up to FIGHT a DUI case. We have no interest in helping you plead guilty to a crime that will be on your criminal history for LIFE. Our job is to leave no stone unturned, and look behind every tree for any “crack in the armor” of the police officer’s case against you. Our clients expect us to help them learn how to get out of a DUI and want to actively participate in the process of winning their Georgia DUI case. Call our DUI law firm anytime day or night at 404-567-5515 or 1-888-384-4323 (1-888-DUI-HEAD). The call is FREE. 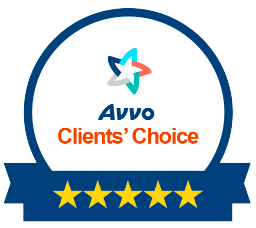 The professional legal consultation is FREE. If you have TOO MUCH TO LOSE, by getting a DUI conviction, why not hire the most experienced and best rated DUI lawyers in Atlanta available? Why not take our FREE legal advice, at your initial DUI defense lawyer appointment, with either Bubba Head, Larry Kohn, or Cory Yager.